The U.S. quietly passed a major milestone in 2016, one that should stick around for a long while. The country has once again become a net exporter of natural gas. It’s been more than 60 years since we began importing more gas than we export, and a few big changes in the market of late are what put us back on the global LNG map. First, of course, is the shale boom. In 2008 (though it actually started much earlier), U.S. companies that had been combining hydraulic fracturing with horizontal drilling techniques hit pay dirt. Between 2005 and 2015, the United States’ marketed natural gas production jumped 51% higher! In 2015, we extracted more than 28.7 trillion feet of natural gas! It took a lot of time and effort to get us to this point, too. We can’t exactly forget the supply glut that has plagued the industry over the last several years. And it was this glut that sent natural gas prices plummeting, which absolutely decimated the prospect of a rally for coal producers. Granted, the double-whammy of the clean energy movement is also contributing to the death of coal. Up until recently, however, there was one serious caveat to North American natural gas producers: they were locked in a regional market. Due to the fact that we use pipelines to transport natural gas, it’s easy to see how limited U.S. companies’ options have been. Naturally, that meant U.S. producers haven’t been able to tap into the world’s growing thirst for natural gas. Since the startup of the first U.S. LNG export terminal, the Sabine Pass in Louisiana, the country has begun exports not only to our southern and northern neighbors, but also to Brazil, India, Argentina, and even China! 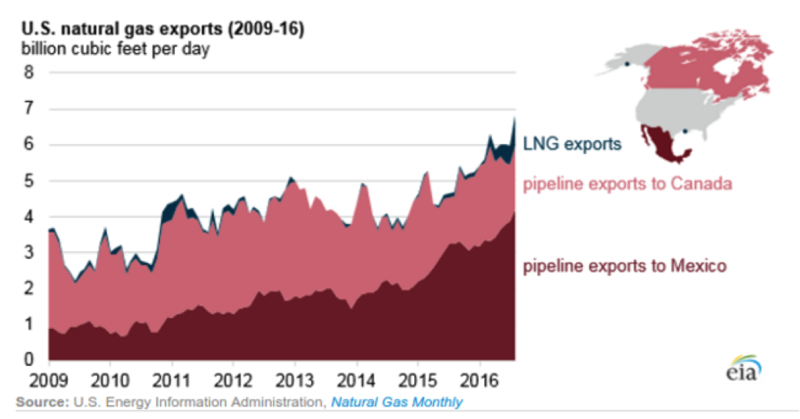 And yet, despite the excitement over LNG, it’s important to remember the reality of the situation behind U.S. natural gas exports. In fact, most people don’t realize that our two biggest customers are Canada and Mexico. Are you now starting to wonder what’s next for natural gas? Well, let’s take a look at one huge catalyst: Donald Trump. Coal’s biggest supporter, President Donald Trump, may or may not be glad to see this shift take place. After all, he seems determined to bring the coal industry back to its former, sooty glory. Yet when you hear him talk about our vast shale gas resources, you can’t help but think that coal’s future is looking dim. Remember, it was the exorbitant natural gas glut that put coal producers in the dire situation they're currently in. So which side is he on? Both, probably... or maybe the one that strikes his fancy at a particular moment. Thing is, he won’t have a choice. And if you hadn’t guessed yet, it’s going to be natural gas. Not only is the market swinging back toward the bulls, but prices are already recovering as the supply glut slowly eases. Coal, on the other hand... well, let’s just say that the country’s energy security is heading away from that industry. And then we have the rest of the world to throw into the equation. Although it certainly won’t happen overnight, countries like China and India won’t have to rely on king coal for very long, especially now that the global LNG market is hitting its stride. For us, natural gas is just starting to heat up. The experts here at Energy and Capital have put together a video presentation that reveals some interesting details regarding the relationship between Mexico, the United States, and Natural Gas. If you do not wish to watch the video presentation but would like to skim the report at your own leisure, you can read the written transcript. Read the written transcript here. 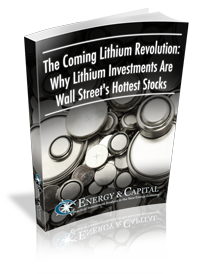 Energy and Capital editor Keith Kohl takes a hard look at how one natural gas catastrophe helped spark a boom in energy storage. Energy and Capital editor Keith Kohl focuses on a developing story that will have far more implications for investors than the Dow passing 20,000. Energy and Capital editor Keith Kohl explains why the death of coal can turn your natural gas investments into a fortune.